In the dark days of the aughts, The Alchemist was basically an obscure little brewpub that made a name for itself by perfecting IPAs and DIPAs. In 2011, they expanded their operation to a production brewery and cannery... right before Tropical Storm Irene laid waste to the pub. Having just opened the cannery, they opted to just sell cans of Heady Topper for a few years while they recouped their losses. They only made that one beer for a couple years, but I guess you can get away with that when it's the single highest rated beer on the planet. Nevertheless, The Alchemist certainly had a growing stable of recipes that were languishing in obscurity, and starting last year, they started doing limited runs of some other beers and dialing in the recipes to be scaled up and brewed on their new system. 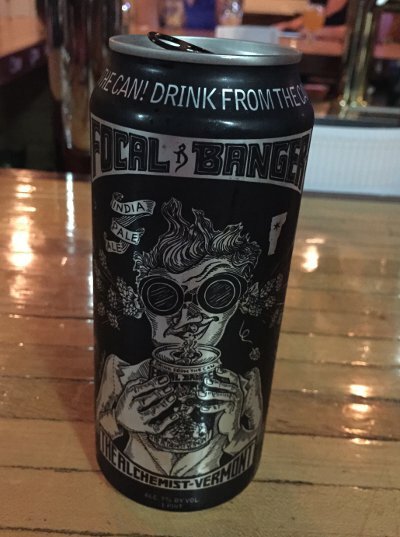 Alchemist Focal Banger - It doesn't pour because you DRINK IT FROM THE CAN, as ordered (the artwork on the can is beautiful though). Beautiful citrus nose, maybe more tropical than Heady, I keep sticking my nose into the can like a dope (or, come to think of it, like the guy on the can). Taste is hugely citrus, tropical fruits, light bitterness in the finish. The Mosaic hops seem to be dominant here. Citra is no slouch, but it has some more subtle components that tend to fall by the wayside when Mosaic is in play, but then, Mosaic really plays well with that Conan yeast, yielding a really juicy, citrusy feel. Mouthfeel shines, well carbonated, silky smooth, almost creamy, compulsively quaffable. Overall, hot damn, another beautiful Alchemist beer, distinct enough from heady, but in a similar vein... A! Beer Nerd Details: 7% ABV canned (16 ounce pounder). Drank out of the can, like a man, on 5/26/15. Totally worth trying to track down if you find yourself in Waterbury, but it sounds like we won't have to wait too long until production ramps up either. Can't wait to be able to actually bring some of this stuff home. Also hoping that the expansion will also include some of their other brews... would love to try one of their imperial stouts, just to see how they handle that sort of contrast. In the meantime, I've got plenty of other Vermont beer to get through, so stay tuned. This page contains a single entry by Mark published on June 9, 2015 7:25 PM. Avery Tectum Et Elix was the previous entry in this blog. Fiddlehead Tejas Marron is the next entry in this blog.